David Lloyd George was one of the 20th Century’s famous radicals. Invariably considered the quintessential Welshman, he was in fact born in Manchester of a fairly humble rank in a highly class-ridden society, the son of a schoolmaster. A highly intelligent child, Lloyd George performed well at school and, partly self-taught, he excelled in his studies at his village school. He left to train as a solicitor, and was articled by the Law Society in 1879 at the tender age of 15. He soon developed a reputation as a lawyer who was willing to defend people against authority. On starting his own legal practice he soon began to gain first-hand geoist insight as most of his cases were against landlords. He married in 1888 to Margaret Owen, the daughter of a wealthy farmer. Lloyd George was by then already a strong supporter of land reform. As a young man he had read the geoists John Stuart Mill, George Bernard Shaw (better known as a Fabian) and Henry George on the need to tackle the issue of land ownership. In 1890 he was elected Liberal MP for Caernarvon (where he also became an alderman), aged 27. His scathing wit and formidable skills as an orator made him a dreaded but respected debating opponent in the House. At the height of the British Empire when nationalism was running hot, he courageously opposed the Boer War (1899 – 1902) at the cost of his popularity. Indeed, one public meeting at which he spoke even ended in riots and deaths – Lloyd George was forced to escape the meeting in disguise. When Herbert Asquith became Liberal prime minister in 1908, Lloyd George was promoted to Chancellor of the Exchequer (1908-15). 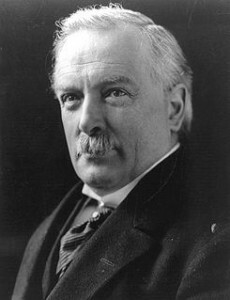 In 1909 Lloyd George announced what became known as the People’s Budget and here began to earn his reputation as one of the great reforming chancellors of the 20th century. He proposed the taxation on the unearned increment in land values, to be implemented when a land valuation register was ready. It was this aspect of the budget that most inflamed the dukes and that provoked Lloyd George’s finest oratory when defending this measure as a means of raising the funds to re-arm Britain: “A fully-equipped Duke costs as much to keep as two Dreadnoughts – and they are just as great a terror – and they last longer.” His firm geoist colleague during these years was a man named Winston Churchill, then president of the Board of Trade. Lloyd George introduced state pensions for the first time and declared a war on poverty. He introduced a super tax on incomes over £3,000 and also passed laws making insurance against ill health and unemployment compulsory. The budget was rejected by the House of Lords, bringing about a constitutional crisis, with the Lords opposing for the first time a government budget. The Liberals built on the unpopularity of the Lords to make the issue of the 1910 General Election, which they won, to reduce the power of the Lords. But, amid all this turmoil and distraction, the geoist land tax campaign of 1909-14 failed. By 1914 the register of land holdings was still not ready. Lloyd George returned to land taxation in his 1914 Budget, relying on his capacity for brilliant improvisation to work out the details, a tactic which had worked when he introduced National Insurance in 1911. This time, on a very complicated subject with powerful vested interests in opposition and no support from his own Treasury officials, Lloyd George failed. The outbreak of World War I put paid to land tax in the UK. During the war, Lloyd George threw himself into the job of Minister for Munitions, organising and inspiring the war effort. He later resigned in protest at the direction of the war, and on the later resignation of Asquith, Lloyd George accepted an invitation to become prime minister and form a government in December 1916. His dynamism ensured he was regarded as the right man to give Britain’s war much needed impetus and it is generally accepted that without him England could hardly have emerged from the conflict so successfully. At the peace conference he mediated successfully between the idealism of U.S. president Woodrow Wilson and the punitive terms sought by French premier Georges Clemenceau. He later led in the formation of the Irish Free State in 1921, though losing Conservative support in the process. But at home Lloyd George’s oratory about constructing “a new society” came to naught – his coalition government needed Conservative backing for reform, and his own efforts were equivocal. When the Conservatives broke up the coalition over the Turkey-Greece crisis of 1922, Lloyd George handed in his resignation. At 59, his ministerial career was over, although he was again leader of the Liberals from 1926-1931. Churchill invited Lloyd George, also an opponent of appeasement, to join the war cabinet in 1940, but he declined on grounds of age and health. David Lloyd George was the first son of the people to reach supreme power, although his geoist efforts were essentially smothered by the landed aristocracy and the untimely intervention of the Great War. But by any measure he lived true to his noble ideals and fought the Good Fight.